The attached image shows M45, better known as the Pleiades, or the Seven Sisters (in Latin America, “the seven kids”, as in baby goats). The blue haze around this star cluster is a reflection nebula — star light is being reflected of soot/dust particles in the background. 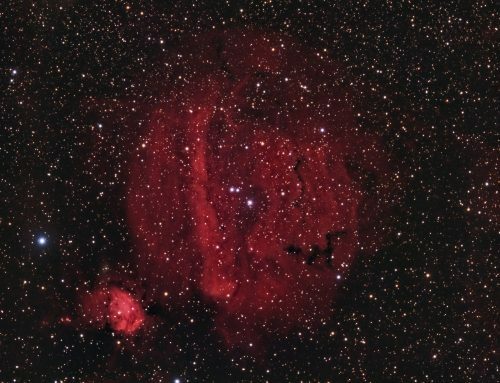 There’s also some pinkish emission nebula in the lower left portion of the nebula and dim brownish dust mottling the outer parts of this field (called “cirrus”). If you get a chance, have a look at this object through binoculars. It is spectacular and well placed high in the eastern sky at dusk this time of year. 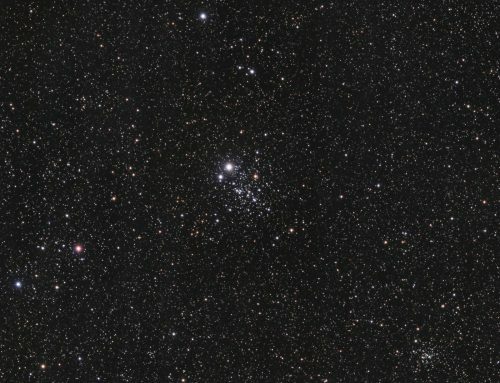 You won’t see the nebula, but the star cluster is impressive in its own right. 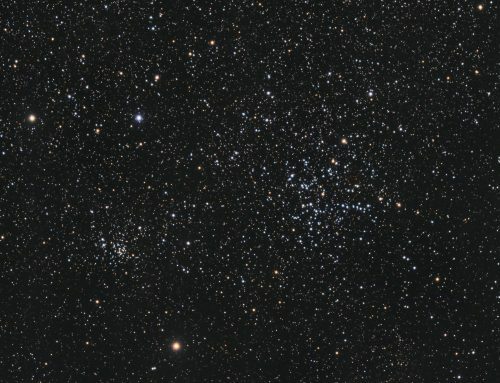 M45 is about 440 light years from us and contains at least 1000 members in the cluster. The stars have been estimated to be between 75 and 150 million years old. 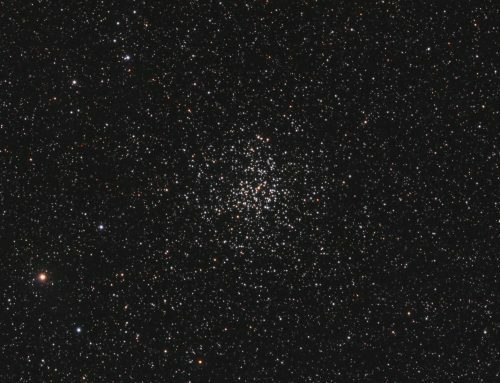 The brightest cluster stars belong to class B, and are very hot bluish stars. 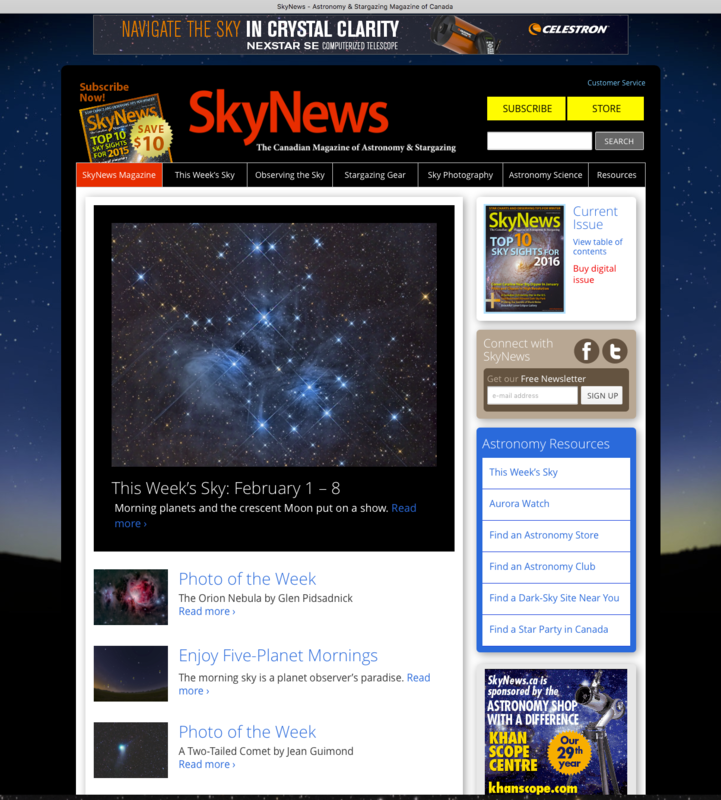 The Pleiades was observed and written about long before Messier catalogued it. Galileo observed M45 with a telescope and published a sketch in 1610 that showed 36 stars. But the earliest known depiction of the Pleiades is from around 1600 BC on a bronze age artifact. Although I am posting this image in December 2014, it was the “official” first light photo using my new SBIG STL-11000 camera, which I purchased in November 2011. It has been re-processed using recently learned techniques. SBIG STL-11000M camera, Baader LRGB filters, 10″ f/3.6 ASA astrograph, MI-250 mount. Guided with internal guider in main camera. Focusing with FocusMax. Acquistion, guiding, calibration, registration, integration with Maxim-DL. All processing in PixInsight. Shot from my SkyShed in Guelph, Ontario. No moon, average transparency and seeing. 23x2m L, 6x3m R, 4x3m G and 4x3m B unbinned frames (total=88m). R, G, B and L masters were cropped and the R,G,B combined to make an RGB image. This was processed with DBE and ColourCalibration. HistogramTransformation was applied, followed by TGVDenoise and another HistogramTransformation to reset the black point. SCNR was applied to the background. Creation and cleanup: The cropped L, R,G and B masters were combined using the ImageIntegration tool (average, additive with scaling, noise evaluation, iterative K-sigma / biweight midvariance, no pixel rejection). DBE was applied to neutralize the background. Stretching: HistogramTransformation was applied, followed by TGV Denoise and another HistogramTransformation to reset the black point. No pixels were clipped during either stretch. 3. Use ChannelCombination in the Lab mode to replace the luminance of the RGB with the fitted luminance from step 2. 4. LRGBCombine was then used to make a SynthLRGB image. LinearMultiscaleTransform was applied to a copy of the image to extract the first 5 wavelet layers (no residual). This image was renamed SS (small scale). PixelMath was used to subtract SS from the SynthLRGB with no rescaling. 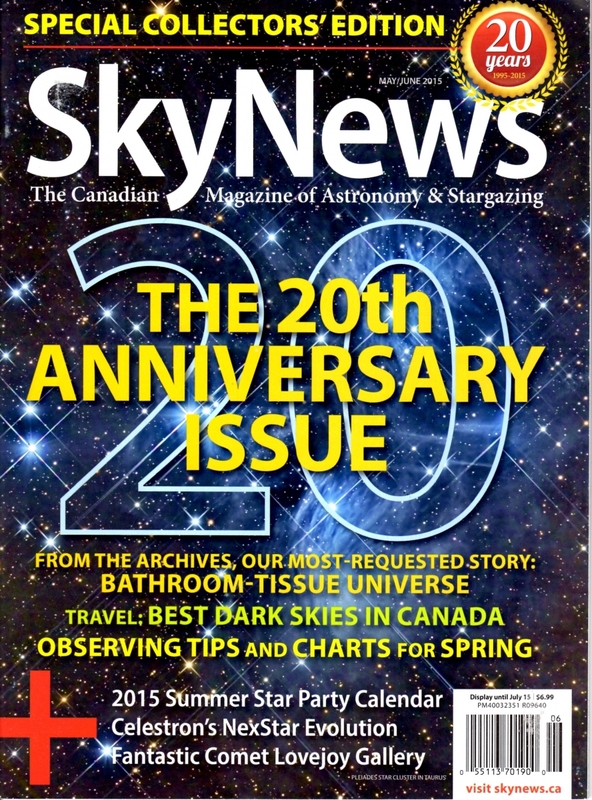 The resulting image was renamed LS (large scale). Colour saturation was decreased on LS and increased on SS (goal was to increase star core colour and decrease all other colour). Contrast was adjusted in LS to darken the background. PixelMath was used to add SS and LS (no rescaling). Several different masks were used with Curves to adjust brightness and saturation in different parts of the image. Unsharp mask was applied to the bright areas of the nebula. Image scale is about 2 arcsec per pixel for this camera / telescope combination. 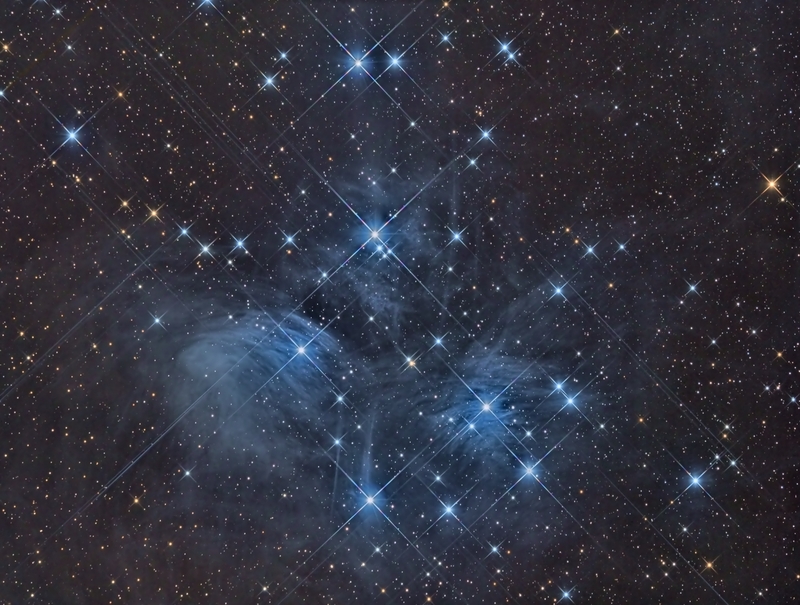 Ron, thank you for sharing this amazing image of the Pleiades!!! This small cluster is so beautiful, and easily accessible in Autumn in Canada…. You’ve really brought out amazing details with your processing, and created a true work of art… Thank you, too, for sharing the demanding process you used to bring out all this beauty!! Bravissimo!!! Thanks so much for yet another wonderful image. The Pleiades are my favourite astronomical sight because I can clearly see the wonderful blue nebula and it’s such a vibrant, powerful and intense cluster. I get the shivers every time I look at it.